Billions of Android, iOS, Windows and Linux devices that use Bluetooth may be exposed to a new attack that can be carried out remotely without any user interaction, researchers warned. According to the security firm, the attack only requires Bluetooth to be enabled on the targeted device – no pairing is needed between the victim and the attacker’s device, and the Bluetooth connection does not even have to be discoverable. A hacker who is in range of the targeted device can exploit one of the several Bluetooth implementation vulnerabilities that can lead to remote code execution, information disclosure or man-in-the-middle (MitM) attacks. The attacker only needs to determine what type of operating system the target is using in order to deploy an exploit specific to that platform. BlueBorne does not require the targeted user to click on a link or open a file, and the malicious activities can take place in the background, making it less likely for the victim to notice anything suspicious. And since the attack leverages Bluetooth, a less common attack vector, many security solutions may not detect the malicious activity, Armis said. The flaws can be exploited by malicious actors to deliver ransomware and other types of malware. Armis claims the technique can also be used to create a worm that spreads from one device to another via Bluetooth. Armis showed that an attacker can also exploit one BlueBorne vulnerability to launch MitM attacks against Windows machines and redirect the victim’s browsing session to a phishing website. Another video shows a hacker taking control of a Samsung smartwatch running a Linux-based Tizen operating system and eavesdropping on its owner. 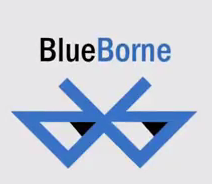 Vulnerabilities that allow BlueBorne attacks have been found in several implementations of Bluetooth, including in Windows, Android, Linux and iOS. Experts discovered information disclosure and code execution flaws in Linux; one vulnerability that allows MitM attacks in Windows (CVE-2017-8628); four code execution, MitM and information disclosure vulnerabilities in Android (CVE-2017-0781, CVE-2017-0782, CVE-2017-0783 and CVE-2017-0785); and one code execution flaw in the Bluetooth Low Energy Audio protocol used by iOS. Google patched the weaknesses in Android with its September security updates. Microsoft told SecurityWeek it released fixes for Windows in July, but withheld disclosure until other vendors could develop and release updates. Apple has already addressed the vulnerabilities with the release of iOS 10 (one year ago) and Apple TV 7.2.2. Earlier versions of the Apple operating systems are still vulnerable to attacks. The developers of Linux distributions have also been notified and are also said to be working on patches. Armis has released some technical details about each of the vulnerabilities, but it will only make the exploits available at a later date.